It wasn’t too long ago that canning was a quaint skill relegated to the hot, humid kitchens of Grandma and Great Aunt Pauline. Somewhere in the past few years, though, that has changed in a big way. Canning is now a hot, hot trend, in large part as a backlash to the widespread rejection of the S.A.D. (Standard American Diet) and a return to whole, healthier foods. Millions of Americans want to know exactly how their food is produced and packaged, and they aren’t satisfied with government-approved labels. Approval by the FDA and USDA doesn’t exactly elicit wide-eyed trust anymore. 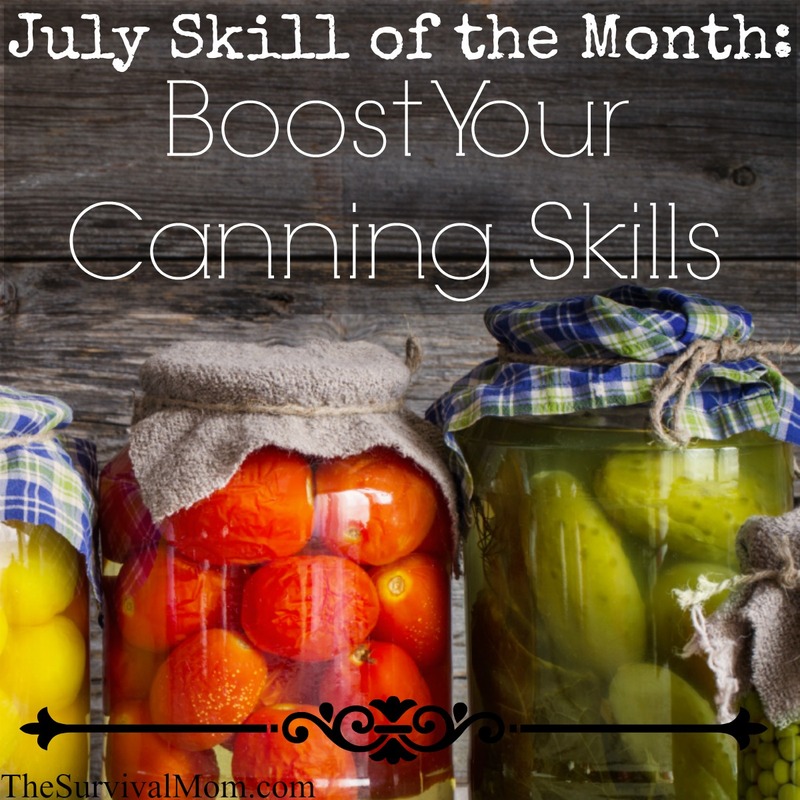 This month, if you haven’t tried canning, I’m challenging you to give it a try. Learn how to can! Start with water bath canning and a few pounds of fresh tomatoes. This is a very easy and rewarding project, especially if you find yourself frequently purchasing canned tomatoes. Some food experts aren’t a big fan of canned tomatoes and fresh is always best. All canning projects start with jars, lids, and rims. The rim is the round open portion that screws on top and seals the lid to the jar. It’s best to buy canning jars made by Ball and Kerr. I’ve purchased Walmart’s canning jars, and they are cheaper, but I’ve read numerous complaints about them. These jars will last for years and years, if not decades, so purchase quality jars, even if they come from second hand stores and yard sales. The lids can be used only one time but the rims can be re-used as long as they are rust-free and in good shape. Here’s a handy canning jar guide you can download. 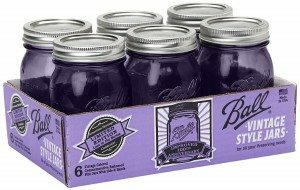 Purple canning jars? Why, yes, thank you! Jumping on the popularity of canning, Ball now offers their jars in beautiful colors, including this gorgeous blue, green, and purple. The jars also come in regular mouth and wide mouth openings. I’ve always preferred the wide mouth jars, just because they’re easier to fill. When you purchase canning jars from any store, and you’ll find them everywhere from grocery stores to Walmart and Target, they will come with the lids and rims. However, you might want to buy extra lids, in particular, and you’ll find them on sale toward the end of the fall canning season. By the way, for many canning fanatics, there is no such thing as “canning season”! 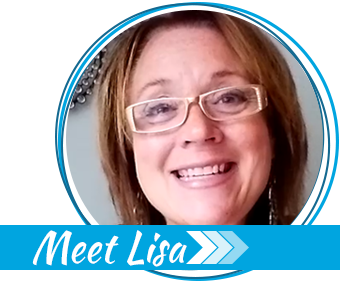 They can all kinds of food year-round, including things like spaghetti sauce and homemade soup. If you start with water bath canning, you’ll need a very, very large pot, one that can accommodate several canning jars. I’ve heard of some people using whatever large, deep pot they happen to already have, and this is fine. Just make sure the pot is deep enough to allow at least 2-3 inches of water over the tops of the jars. This is the water bath canner I own. The water bath canner pictured here is the one that I own and use. 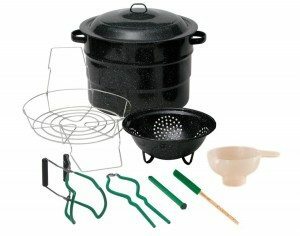 You’ll notice that this particular pot comes with several accessories that are not only helpful, but necessary. For example, there really is no safe substitute for a pair of tongs large enough to remove scalding hot jars from boiling water! 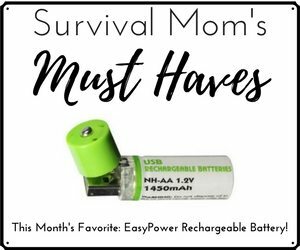 You’ll need these! Although the water bath canner is the easiest one for most people who are just getting started, it’s important to know that not everything can be canned using this method. Pretty much, everything else needs to be canned in a pressure canner. One reason I like the pressure canner method is because, with its tight fitting lid, all the steam is kept inside throughout the canning process. This was especially appreciated on hot summer days in Phoenix! If you can imagine opening a large, quart jar filled with your family’s very favorite soup, salsa, or marinara sauce, you’ll really come to appreciate using a pressure canner for its versatility. One final note about food safety is that it’s strongly recommended that you stick with canning recipes that have been tested by official canning kitchens and experts. 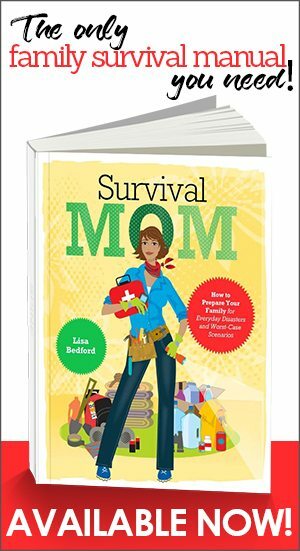 I know that many, many experienced canners can all types of things that aren’t officially sanctioned and haven’t been tested for safety, and they insist that their family has used the recipe and canning technique for generations. 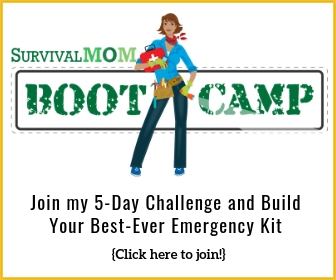 However, I have to err on the side of caution and say, go with what has been tested and approved by organizations such as Ball, the National Center for Home Food Preservation, and extension offices around the country. If your garden is overflowing with abundant produce, you’ll have no problem coming up with loads of fresh fruits and veggies to can. However, most people struggle to grow even a few tomato plants! For cheap produce in large quantities, seek out produce co-ops in your area by doing an online search. Bountiful Baskets is a great resource. Look for exceptionally low prices at grocery stores and, in particular, ethnic grocery stores. One year I bought a massive amount of Roma tomatoes at a Hispanic market for just 20 cents a pound! 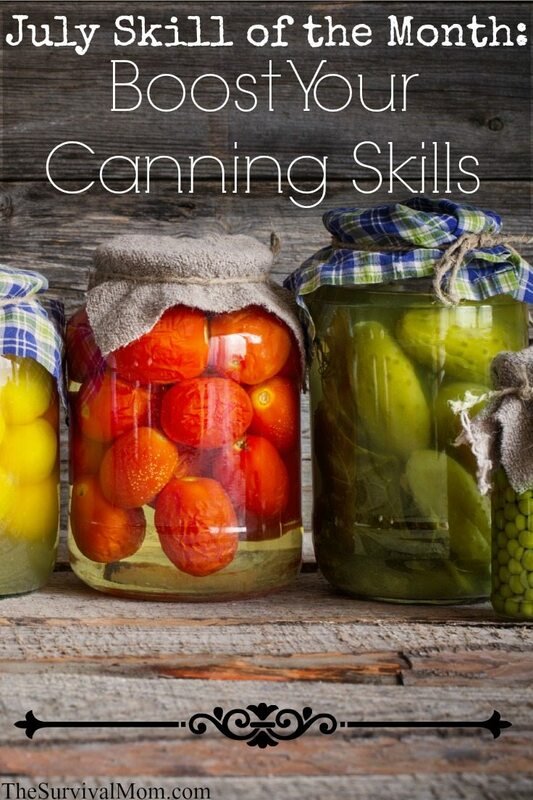 There’s more to canning than this article! Entire books have been written about canning and there are probably hundreds of websites that are devoted to canning and only canning! As well, you’ll find numerous articles here on the blog. Watch this webinar that I taught a couple of years ago, covering the basics of canning, Canning 101. Enjoy preserving fresh food by learning how to can! I’m terrified to can. I love the idea and want more than anything to do it. But I’m also scared that one mistake will cost me and my family our health. How do you get past that fear? I’ve taken a class or two, but the cans that I did in class went home and straight into the fridge!! Gha! I was terrified at first too, until I realized that water-bath canning fruits/jams is quite low risk. You are not going to get botulism from water-bath canning jams, the problem is mold. If there is a problem with a seal, you are going to SEE that there’s a problem via mold etc. so you’d just throw it away before eating. Start with water-bath canning some jam until you are more comfortable with canning. You really aren’t risking your family. The bigger risk is pressure canning because that’s the one that can involve botulism, which you can neither see nor smell ahead of time. However, as long as you follow the rigorously tested recipes exactly and are careful in your technique, botulism risk is extremely low. I took a refresher pressure canning class last night and the master preserver was telling us that EVERY case of botulism that has occurred in recent years in our area (very few in total) has involved someone who did not follow correct canning directions or did not use a tested recipe. *Every* case. So the main thing is to train thoroughly and follow directions exactly and you’ll be fine with pressure canning. If that is too nerve-wracking to you, then just stick to jams in water-bath canning which is EXTREMELY low risk. Start small and build your comfort level in little steps. I love to can! I have always made jams, jellies, and pickles. I was given as a gift, a small pressure canner and learned how to can vegetables. I moved on to canning homemade pea soup as I was the only one in my house who would eat it. That way, I could make a batch, can it, and have it whenever I wanted it without it going to waste. My mother handed me down her VERY large water bath canner and her VERY large pressure canner as she doesn’t can as much anymore. I learned to can chicken this year after seeing that my stepmother cans chicken and beef. I have canned 20 half pints of chicken breast so far. The half pints are perfect for the two of us for chicken salad and such. It is an economical way to put up food for the year. When strawberries were in season, I made enough jams to last us the year. When anything is in season, I try to can enough to last us until the next year when the season rolls around again. It gives me peace of mind knowing that I have that food in my cupboards and don’t have to pay the high prices at the store or wonder where it came from. TRY IT, YOU’LL LIKE IT!!!! Canning is a wonderful, satisfying skill. If you start out with something simple using hot water bath process to get your confidence, you will be pleasantly surprised. I am nearing the “magic” retirement age (I can’t say my age without freaking out) & I learned to can ions ago in Junior High School Home Economics. I wouldn’t call myself an expert but I do a decent job & so far I haven’t poisoned myself or anyone else. I waiting for a good sale on boneless pork sirloin so I can try my hand at canning pork; always something to learn! I recommend buying yourself the Ball Canning Book. It’s easy to understand, has lots of pictures, graphs & charts. Invest in a canning funnel, the special tongs to hold/remove the hot jars & invest in an inexpensive plastic, medium-sized ladle with a fairly long handle. When you buy your jars, I highly recommend the wide-mouth size; pick up an extra package of lids. If in doubt about what size jars to buy, go with pint size to start. Your Walmarts may sell a very small box of Kosher salt, it’s great for all canning except making pickles/brining. Regular Iodized table salt won’t ruin your product but it does affect the color of any liquid or broth a bit. Check your recipes, most say salt is “optional”. A lot of people have never eaten corn relish but it’s really good & can be used in similar fashion as “regular” relish or served on the size with ham, etc. The recipe is for 6 half-pints (8 ounces) but can easily be cut in half & you can use 6 4-ounce jars instead of the 8 ounce jars. The finished product is pretty & you can always give a few away as gifts. I have made this recipe with thawed (in a strainer) frozen corn & I can’t tell the difference between fresh & frozen corn in the finished product. Most of the meeded ingredients are either already in your kitchen or can be purchased for a reasonable sum so if something does go wrong, you won’t be out a lot of money. If you use frozen corn check bag to see if there’s salt; you can rinse corn after it’s thawed to get rid of the salt. Make sure you get all the water out of the corn, it needn’t be dry but shouldn’t be soggy. So, round up your ingredients, measuring cups & spoons. Buy a 6-pack of jars & give it a try. I think you’ll be pleasantly surprised at your results! TIP: don’t buy cheap store-brand white vinegar, get a brand name such as Heinz. Dig through your junk draw & find a pair of wooden chopsticks to remove any air bubbles after filling jar; never bang glass jars on the counter to remove bubbles & metal utensils can scratch canning jars. Good luck, enjoy & welcome to the wonderful world of canning!! You’ll do just fine.